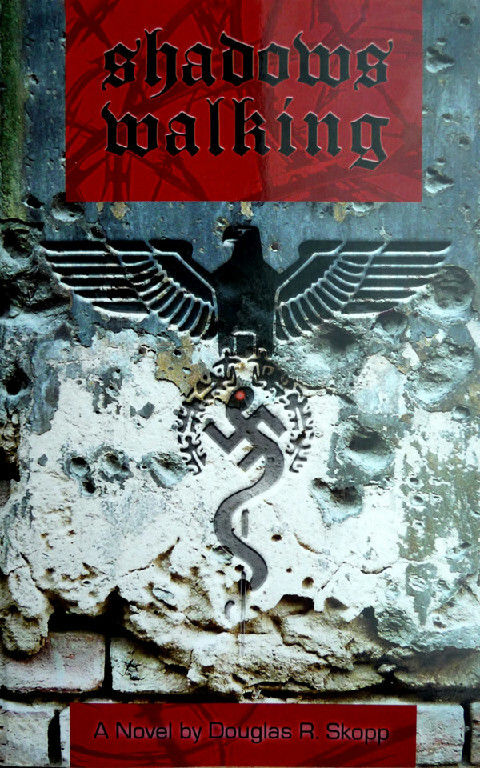 Taking its title from a passage in Macbeth, Shadows Walking takes the reader into the nightmarish descent of modern German history. Skopp traces the lives of two men – Johann Brenner, an ardent nationalist, and Philipp Stein, a Jew – throughout their military and medical careers. Brenner and Stein endure the hardships of the First World War and the economic uncertainties of the Weimar Republic. The rise of the Nazis causes their friendship to fracture. The novel begins in the postapocalyptic wasteland of Nuremburg with Brenner, under an alias, working as a janitor in the Palace of Justice. The Doctors’ Trial is beginning and Brenner listens to the horrific testimony of a victim. The testimony concerns castrations done by SS doctors at concentration camps. With the starvation, destruction, and desperation outside, the witness’s testimony hits the reader like a vicious sternum punch. The graphic descriptions bring home the horrors of the Holocaust. Even amidst the hellish experience of the Holocaust, the medical experiments performed by Mengele and his associates stands unique in its horror and obscenity. The novel achieves brilliance in its accretion of details and experiences in the lives of the two main characters. The common question is: How could Germany, which has such a rich tradition of arts, sciences, and philosophy, create such a barbaric and evil regime? Skopp tries to answer that question through indirection and burying himself in the minds of Brenner and Stein. The two are seen as “ordinary” Germans, not as famous political and historical figures. Through the years, we see both enduring “death by inches”, to use another phrase from Shakespeare. Compromise, desperation, and stubbornness contribute to the choices they make. The book has passages, illuminating the inner thoughts of Brenner and Stein that lend the narrative a haunting plausibility. The anthropomorphizing of German Culture in philosophical discourse combined with the medicalization of this discourse to create the idea that Germany, following the First World War, is sick and corrupt. Philipp Stein sees the remedy in positive eugenics, although he slowly backs off the idea when he sees it done in everyday practice. Johann Brenner also sees a eugenics-based solution, but resentment, economic desperation, and death push him towards the National Socialists. Brenner isn’t one to question authority figures and his personal circumstances lead him to find a scapegoat for his (and the nation’s) problems. Skopp’s self-published novel weaves a Balzackian tale that perfectly captures the ideas and lives of a specific time and place. Skopp’s background as a history professor merges with his desire to tell a compelling story. He also creates a historically authentic narrative that forces the reader to question the validity of his or her beliefs, yet, at the same time, not doing it in a manner that comes across as preachy or heavy-handed. The novel aims to explore the questions we must face with the deeds perpetrated by the Third Reich, but it has the audacity to point back at the reader. In the dark corners of our being, although we usually don’t admit as such, either to each other or to ourselves, we are capable of perpetrating criminal atrocities against each other. Like a boiling frog, we don’t always realize the rationalizations and self-justifications we construct to distance ourselves from actions of criminality and evil. Shadows Walking illustrates we only need a little push and we will devour each other.